Last Christmas it was time to replace my 8yr old daughter's aging Dell Mini netbook. So we made another switch, handing down the Samsung Series 5 to my daughter, and buying my wife a new Samsung Chromebook Wifi 11.6". At $249 it was half the price of the $499 I paid for the Samsung Series 5. Slightly smaller and lighter, and importantly a little more powerful. We decided on just the Wi-Fi model this time to save a little money. We had used the 3G on the Samsung Series 5 a few times, and after some initial setup challenges, it worked very well. But we were also in the market for a Wi-Fi Hotspot (and eventually bought a TruConnect Internet on the Go Wireless Hotspot) which satisfied our 3G needs for this and all our other internet devices when traveling. As others have written this is a solid little Chromebook. The chiclet keyboard is great for a device at this price point, I would argue as good as the keyboard on my MacBook Air. The touchpad is a little more solid than on the Series 5, although not as easy to click as my MacBook. The screen is very crisp. All around, for $249 it's a very well built and attractive device. The other good news since I last wrote about Chromebooks, is they have become a lot more stable. Even our old Series 5 that our daughter uses no longer experiences the Aw Snap! screens that I was getting multiple times a day. I showed my daughter a screenshot of it this morning, and she said she has only seen it "3 times in her life". And that's after 3 months of using it every day. Similarly my wife has been using this new Samsung Chromebook - which I'm also using to write this blog - for 3 months, and has not complained. So I'm back to recommending Chromebooks for non-developer people - or as a traveling computer, if you don't already have a MacBook Air. I love the fact that since replacing my wife's Windows Dell Laptop and my daughter's Ubuntu Dell Netbook with Chromebooks, I can count the number of "tech support" requests I've had on one hand. Which compares to the previous multiple requests for help per week. 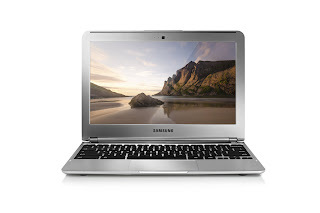 In addition to this $249 Samsung Chromebook, there are also now two other low cost models available. The $199 Acer C7 Chromebook, and the newer $330 HP Pavilion Chromebook. I haven't had an opportunity to get my hands on these models yet, but from the reviews I've read I'm still comfortable that the Samsung Chromebook is the best choice at the price/performance/aesthetic we wanted.